Publishing options: traditional, self-publishing, e-publishing and more. Birth, wedding, death—all of these events have made up our “biblical” summer. It began with the death of my husband’s mother, a gentle Southern lady with a core of steel. This is a huge loss, not only for my husband and his three siblings and all the grandkids, but to me who thought of Jane as the best possible mother-in-law. She welcomed me unreservedly when I married her son, made me her daughter, chuckled and cried with us at our children’s escapades. I am desolate at her passing but infinitely grateful that she was part of my life. The “wedding” was my daughter’s, only it was not called a wedding, and it felt more like a church service than an event that celebrated family. But it was still special, leaving indelible memories of food and flowers and love and laughter. Now we anticipate the birth of our first grandchild any day now, and I wait with half-held breath in case there’s another event in store for us, such as a flood or fire or surprise of biblical proportions. All these transitions are perfectly normal, yet they produce unexpected swings of emotion and sleeplessness because change is never comfortable. When the emotions have been assimilated, I may be able to writer better, or at least more honestly. My characters may deepen. As in other times of change, I turn to writers who express feelings better than I possibly can. This time I chose Madeleine L’Engle: her not-just-for-teenagers Wrinkle in Time and Meet the Austins and The Young Unicorns affect me like comfort food. Why? Because her families and the loving circles they make remind me of where I came from, and what I hope I created with my own children. And the grandchild to come will just expand the circle. 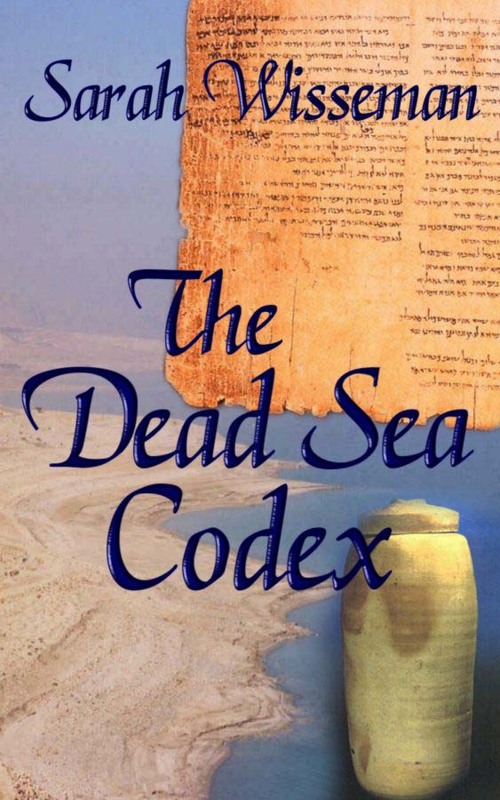 When I began to write my second mystery, “The Dead Sea Codex,” I realized that I didn’t really want to go back to Israel and risk being blown up by a suicide bomber. So I cheated; I stayed home in Illinois. I used today’s virtual magic carpet, the Internet. Lucky me—I avoided the purgatory of crowded airports and multiple gas-powered vehicles to traverse oceans and time zones only to arrive sleep-deprived, sweat-stained, and thoroughly grumpy. Instead, I lounged around in my pajamas and sipped hot chocolate while dragging out all my old textbooks, diaries, and pictures from my Junior Year Abroad. As a visiting archaeology student at Tel Aviv University in the 1970s, I feasted on the exotic. I tasted shwarma (roasted lamb) and six kinds of yogurt, joined an international excavation at biblical Beersheba in the Negev desert, swam across the Sea of Galilee with a hundred other people, and was adopted by a wonderful Israeli family with Russian and Romanian roots. But these memories are out-of-date. What does the Israeli architecture look like now? Is my memory of palm trees and cacti in urban settings accurate? How do you make hummus and tahini dip? What is the name of the female version of the long garment Arab men wear? I found all these things on the Web, as well as listings of current restaurants with their street names, signature dishes, and local beers. 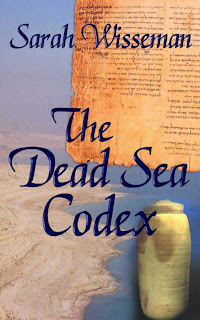 To supplement my virtual findings, I purchased a brand-new travel guide to Israel, dug out my Hebrew grammar book, and reread Dan Brown’s “The Da Vinci Code” and several related books on the Gnostic Gospels, and watched movies set in the Middle East. Creating an exotic setting without going there in the flesh isn’t easy, but it is possible. I created a notebook for my novel, complete with hand-drawn maps of the area around Jerusalem and the Dead Sea, a historical timeline, phrases of Arabic and Hebrew that my characters would hear and speak, and cutout photographs of models that resembled the physical description of my heroine, archaeologist and museum curator Lisa Donahue. I was looking for a way to avoid doing laundry this afternoon and came up with this great scheme - I'll post a laundry list of good mysteries I read over the past year or so and I'll wind up feeling as virtuous as if I actually threw a load in the washer and hung it out to dry. So, here you go, in alphabetical order by author, with only a few side comments to bog you down - books I loved this year in three categories. My life is composed of layers. Layers of personal stuff (family, husband, children, cats), interests (painting, drawing, and gardening) and two jobs. In my day job, I’m an archaeological scientist at the University of Illinois. Our interdisciplinary program explores how science can help archaeologists and art curators decipher their artifacts by examining layers of composition, technology, provenance, and dating. My other job is mystery writing. Gradually I'm excavating my own life to unearth situations and characters that will make good mysteries. These include creepy old attic museums—digs in Israel, Italy, and Nevada—peculiar academic characters that morph into murderers (or murderees!). Like an archaeological dig, a good mystery is constructed in layers: the top layer, or stratum, is what the reader sees and where the main story takes place. A couple of strata down is where the villain hangs out, plotting and planning away, occasionally rising to the surface like a misplaced artifact in an ancient garbage pit. Garbage pits definitely loom large in an archaeologist's life because stratigraphy is rarely orderly. People in the past were always digging holes to lay a foundation trench, bury something (or someone), or to hide some garbage before constructing a new floor. Personalities have layers too, and it's the job of writers to reveal the layers in their characters in ways that move the story along. And everyone has a garbage pit--the family traumas from the past, the dysfunctional relationships of the present. Garbage, like compost, can provide rich beginnings for new stories. For a longer article on this topic, visit the free ezine, Mysterical-E.
Every so often someone in an online group asks what kind of music other members listen to when they write. Instrumental? Classical? Jazz? Only vocals in languages you don't understand so you can't stop and sing along? And does your music choice influence the tenor of your writing - if Miles Davis is wailing in the background, do your characters spend the day frolicking at the beach or are they walking city streets alone after dark? My answers to any of those questions vary according to the day and what I'm working on, though I rarely listen to vocals when I'm writing. I find that even if I don't know what the members of Runrig are singing in Gaelic, I'll make up my own words and sing anyway. It doesn't bother them, but it keeps me from getting much done. When I'm writing a short story I often listen continuously to the same piece of music or CD. Does that somehow help the story have a consistent voice? I don't know, but it hasn't seemed to hurt. Another question I like is what do your characters listen to? In Lawn Order, Margaret Welsh has a shoebox full of CDs she plays for background music in her bookstore. One of the CDs is The Gaelic Collection by Runrig. She enjoys joining the band with her own words as much as I do. A CD Margaret only recently discovered is Yours Truly by Natalie MacMaster. (It came out in 2006 but Margaret isn't always on top of anything other than her book business.) Although it doesn't say so in the book, Margaret two-steps to "Volcanic Jig" from Yours Truly in the after hours dance scene on page 250. I'm in the beginning chapters of a new project and don't know, yet, what kinds of music these new characters listen to. I get the feeling a few of them listen to stuff I ordinarily avoid. Such a shame, but it takes all kinds - of characters and music. It'll be fun sorting it all out along the way. I’m taking a voyage—into the past. To Prohibition era central Illinois, when speakeasies and blind pigs flourished in my hometown of Champaign-Urbana and bootleggers were kings. My fifth novel stars a physician who’s also an amateur archaeologist, his German wife, and a flapper daughter. The research is time-consuming but fun: I’ve taken historical tours of theaters and banks downtown, rummaged through archives on paper and online, and reread F. Scott Fitzgerald with a whole new slant. I expected to write another archaeological novel, but instead I am embroiled in fascinating ways to make, dispense, and transport bootleg liquor. Pool halls that morph into bars with the touch of a lever, home parlors where hooch is poured down tubes by ten-year-old proprietors, and drinking joints disguised as laundries, bookstores, smithies, and lawyer’s offices. I’d be tempted to try some of the recipes, only that involves using lead-lined radiators, wood alcohol, embalming fluid, and all sorts of unregulated additives! We used to live in Cincinnati, a fascinating town with a rich history. Recently I stumbled upon an online chapter of a book, Brother, Can You Spare a Drink? by Allen Singer: http://www.allensedge.com/prohibition.html. Wonderful stuff! I especially like the booze tube covered with a throw rug and artistically strewn schoolbooks…Thank you, Allen. Mystery authors Molly MacRae and Sarah Wisseman. Molly MacRae is the author of Lawn Order (2010), a Margaret & Bitsy Mystery, and Wilder Rumors (2007), a Lewis Wilder Mystery. She also writes the Margaret & Bitsy short stories appearing in Alfred Hitchcock Mystery Magazine. Sarah Wisseman writes the Lisa Donahue archaeological mysteries: Bound for Eternity (2005), The Dead Sea Codex (2006), The Fall of Augustus (2009), and The House of the Sphinx (2009). She is currently working on her first historical mystery, set in Prohibition era Illinois.